Do I need a sensor in the ground? When I tell people that Weather Reach smart irrigation control automatically manages watering schedules, I often get asked the question, "Do you use sensors in the ground?" 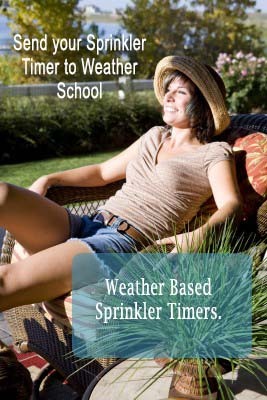 No, climate controlled irrigation is simpler, more reliable and cost effective. Intuitively people think you need a sensor in the ground to accurately control irrigation. Recently I have been reading a book on military strategy; interesting and complicated. Quite frequently the author points out indirect assaults are more effective than a direct approach. In other words, solve the problem by coming at it, in an indirect way. Climate conditions affect plant water use. We can measure weather conditions to know how much water plants need. This indirect approach is simple, reliable and cost effective. We know when it is hot, dry, and windy plants need more water. When it is cool and cloudy we don't need to water. Farmers have been watching the weather for thousands of years to know when to water. Today the science is refined and accurate, using climate sensors to know how much water a plant needs. All Smart control systems depend on sensors. Sensors reports conditions. Smart control systems react to those conditions. With such a dependency on sensors they must always give good measurements. When you bury something in the ground it begins to deteriorate. Sensors on our weather stations deteriorate, so they get cleaned, recalibrated and replaced on a regular basis. This is so much easier than having to dig up sensors. If you put a sensor in the ground how long will it last? How do you know when to replace it? Where is it? One of our first big projects went in about 8 years ago. Over 1000 of our first climate controlled irrigation products were installed in a subdivision. One weather station controls the entire project. The sensors at that station are maintained. If this project used soil moisture sensors instead, how many would it have taken? 2000? 4000? Who knows? It just doesn't make sense to bury thousands of sensors and expect them to work for the next 20 years. We need sustainable solutions. I saw one of the first climate controlled irrigation systems in 1982. A weather station was connected to an IBM PC that controlled irrigation on a golf course. I was hooked and have been involved with climate controlled irrigation ever since. It works, and it's simple, more reliable and cost effective.